I find Harleys a bit baffling. I also adore their character, understand what they stand for and do. But what baffles me is how much the marketing and the aura are part of the experience and how much in proportion terms, is engineering and other more tangible aspects of motorcycle design and development. To give you a quick example, how can a modern company not tell you the peak power of their engines? But it's because (they say) their story is one of torque and its abundance and not of horsepower. Because it is the Harley way and so forth. And yet, there it is, a centennial centurion calmly collecting customers who couldn't care less about the peak power. And on to the Street Bob, then. I, obviously, do not know how much peak power it makes, 70PS would be my guess. But it does make 124.9Nm of torque at just 3,250rpm. And that torque is one of the nicest things about the Street Bob. Plus now it's assembled in Harley's Indian facility at Bawal, Haryana. So you get the TwinCam 96 named 1584cc V-Twin, mounted on a bobber-style Harley at a very reasonable price. 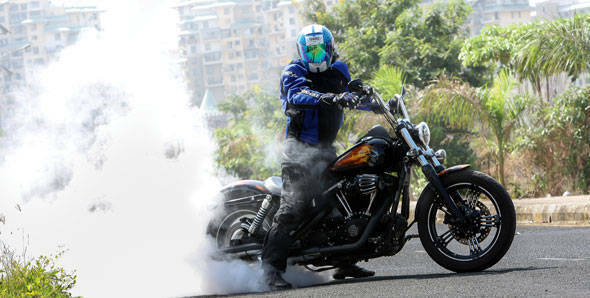 The Street Bob is just Rs 11.5 lakh, ex-showroom. The bobber bit refers to Harleys that owners would strip of all the superfluous bits to extract as much performance as possible. It led to these pared down motorcycles which have a very distinct look, and that is the silhouette that the Street Bob goes for. Personally, I like this look a lot. I rode the Street Bob - in unmodified form - earlier and I absolutely loved it. The handlebars, seat and footpegs felt just right to me as did the sloping, massive 17.3-litre tank, the single seat and that fat rear fender that ends in a weird tail lamp referred to as a sausage light in some places or likened to a flaccid male member in others. But the Street Bob in the pictures here has changed. For the Auto Expo 2012, HD India wanted to focus on modifications and this was the result. The front and rear fenders and the tank wear limited edition (200 units only) Devil's Infantry paint. Then there is a slew of dark custom line bits (as in the black bits, as opposed to chrome). These are from the edge-cut series (as in black chrome is machine-chamfered to create the contrast between brushed metal finishes and the black chrome). You can see these all over the bike from the alloy wheels (the stock bike gets spoked rims) to the handlebar grips, air filter and so on and so forth. Screamin' Eagle, the company's high performance line supplies the massive air filter, the exhaust pipes and high tension spark plug leads and more to the motorcycle. Which means the performance numbers below are as tested rather than for the standard Street Bob. And it's precisely because of all the mods that all is not well with this particular motorcycle. The thing about modifications is that it must fit someone perfectly. Or as Harley marketing like to say, there's one specific Harley that fits one specific rider - referring to their extensive product and accessory catalogue and the average owner's penchant for altering the stock motorcycle to his or her own ends, tastes and needs. Well, this motorcycle, then, was built for a six-foot-four individual with an arse made of pure titanium. At six feet tall in boots, I had significant amounts of trouble reaching the bars with my hands, pegs with my feet and seat with my bottom all at the same time. Two of three isn't all bad said Oliver Barrett IV to Jennifer Cavalleri. But this isn't 'Love Story' and this heavily modded Bob isn't a recipe for a good ride. Our 350km 'weekend' ride turned out to be quite painful. Then Ashok et al, much smaller than me in girth and height had still more trouble. The edge cuts on the handlebar grips are pure torture. I was worried I'd have a blister before the ride was over - and that's despite the fact that I never, ever, ride without gloves. The irony of it is that the stock motorcycle is actually amongst the most comfortable Harleys I have taken out for a spin so far in every ergonomic aspect. That said some of the custom bits are beautiful. I loved the skull shaped gas tank caps (there're two of them) and the left side one incorporates blue LEDs into the teeth which glow back the fuel level at you. Sweet! The other thing that really bugged me was the key. It's small and stubby as usual but the Bob has the key slot near the bottom triple clamp. Not a comfortable reach from the seat. But what is worse is that in the off position the key simply falls out. I lost count of the number of times this happened and it bugged me intensely. The final crib, then, is the ride quality. The Harley is brilliant on good roads. But on indifferent to bad roads, as expected, the suspension works very hard but ultimately fails to isolate you from the road. It's also a bit strange because you feel sharp things like reflectors very well but then the expected shock of a really large bump never actually arrives. And further on a middling sized bump has you out of your seat. You can live with this motorcycle, I say, and do big pan-India miles as well. But I'd advise you to stay close to the Golden Quadrilateral (smooth, recently surfaced roads). So, the story so far. Make mods carefully, it's a very nice looking motorcycle to start with in the first place. The key is an irritant. And do not buy this Harley for its ride quality. But there are hundreds of reasons to actually go and buy this Harley. And I've been saving the best for the last. First of all, that engine. It is absolutely, totally all-American rosy-cheeked, mountain sunrise, playful puppy, pneumatic blonde wonderful. With the Screamin' Eagle bits on, it gives the bike a loud, impressive (though just marginally wheezy) idle. It sounds marvellous and if you find a passer-by who will not turn to look at the bike (usually followed by a thumbs up, a smile, a wave or all of the above), I'll bet you s/he is hearing impaired. There're loud clunks from the gearbox (this is normal) but it channels a torque-wealthy engine that is both smooth and refined and has just enough vibration to let you know that this is a Harley pushrod engine you're cruising about on. There's great torque from idle, throttle response is surprisingly crisp and the way that immense rear tyre hooks up and causes the bike to surge forward (think big ship accelerating hard in your head, as opposed to a small car) is addictive. The backtrack of the V-Twin and this sensation is enough to make you never want to settle at a given speed. You will keep wanting to raise and drop your speed constantly to hear it burble, warble, sing and then hook up and raise its voice again. It's sensational. On to more practical matters, this is a quick bike. It hits 100kmph in just 5.7s and we could only hold onto it till about 157kmph (167kmph indicated) before the wind pressure forced us to back off. On the other hand, trundling along (the Americans call it profiling) at low speeds in high gears is ridiculously comfortable, as is 120kmph on the highway. And on the open road the green '6' indicator on the meters is useful, because it is easy to find a sweet spot in fourth or fifth gear and forget entirely about sixth gear. The rear brake pedal is hard to reach in this custom format and the front brake on our bike felt a bit weak. But it does work and the stock motorcycle, I must note, is far superior in this respect to our test bike. Once again, in corners, the Harley is great fun. The sense of impressive mass - this is a 304kg motorcycle in kerb weight - going over into a corner and taking up lean is very satisfying. You do grind down hard parts before you run out of tyres as usual but this overbuilt, heavy steel frame (rectangular backbone, rectangular-section swingarm) doesn't flex, doesn't squirm and gets on with cornering. Given its size, especially with the custom controls, walking pace manoeuvring is harder but it all works. In time, we were pulling 5kmph feet-up u-turns on dirty, gravelly roads with nary a care, a testament to how well-balanced the typical Harley is for this kind of thing. When it came time to return the Harley I found myself sitting on conflicted sensations. I hated how hard the custom bits on this particular bike made riding it. But it reminded me even more strongly how much I'd enjoyed riding the unaltered Street Bob earlier and made me long for it even harder. The unlockable gas tank cap and falling out of the key were the two ownership related question marks that remained. The rest was easy. I still believe the Super Low is a superb Harley for India. And if you have the budget to look beyond that, then the Street Bob is the bike that you should open your wallet for.